I’ve owned these for three months now, so I figured I’d pen a few notes about it. If you’re considering one, the short answer is “Yes”. As bluetooth headphones go, the Nokia BH-214 ranks among the cheaper bunch. The fact that you are considering it probably suggests that you were attracted by the price. That is not all this device has to offer though. It’s design is rather unique in that there are no visible wires on the device that are not user-replaceable. The wire that takes the sound from the flat, slightly playful looking device pop out from the top, and can be replaced with any standard 3.5mm headphones. The supplied set are the best fit though, since any other pair would leave you with an unwieldy mess of wires. The fact that the actual ear pieces are replaceable with any pair of standard 3.5mm headphones comes in handy often because the default set are not exactly groundbreaking in terms of sound quality. I often plug in a set of Sennheiser CX-300 whenever I want to listen serious music, using the BH-214 as my phone’s remote control and as a hands-free microphone. Thus far, we see that the Nokia BH-214 is a reasonably priced bluetooth stereo headset with an interesting and durable design, but not too great sound quality with the default ear pieces. That describes the device quite adequately. However, I should point out that the sound quality is not exactly a deal-breaker, but having owned and used a Sony DR-BT20NX and a Nokia BH-503 to date, I perceive a noticeable lack of vibrancy to the sound output of this tiny device. Another small issue, which took some getting used to for me was the smallish power button. If you own or plan to get this device, you will do well to remember that the power button requires a long press, not a hard press as you might think, since the button seems a little hard to press and doesn’t give a strong tactile feedback when pressed. Just press lightly, but hold for about 4 seconds. It also helps if you have an ear piece in your ear so that you can hear the power-on beep. 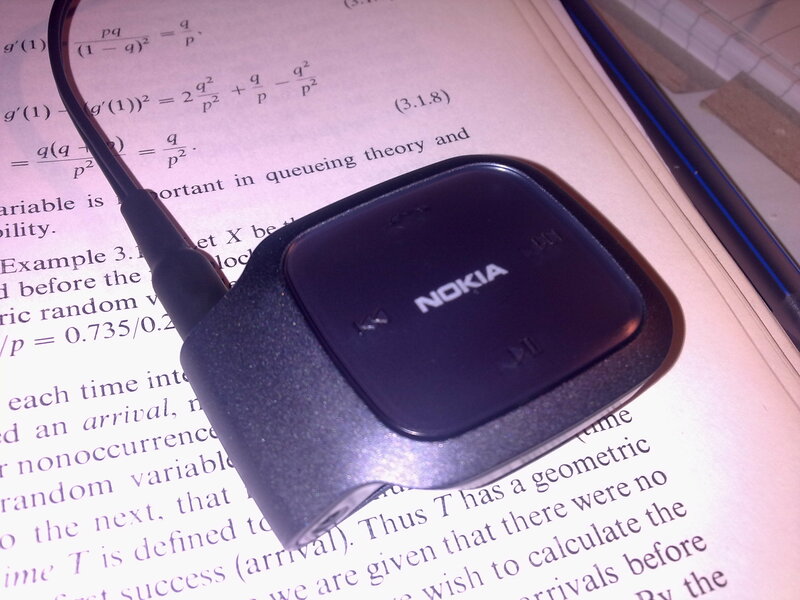 The Nokia BH-214 sports the usual assortment of lights that are typical of bluetooth audio devices. Blue blinking LED indicates active connection, green blinking LED indicates powered on but not connected, and the red light flashes occasionally to indicate a power on/off event or a low battery warning. Compared to my previous bluetooth headphones, this set seems to sport a slightly shorter battery life, putting out about 8 hours of continuous playback, which is enough to last me three days, but which has the habit of running out at inconvenient times. This is no fault of the device though. Lest I forget, the ear pieces are ear buds (rubber cones) and are comfortable enough to use. In summary, I do not regret spending my money on this adorable device. It does not provide top of the line audio experience, but it is good enough for my (I like to think) moderately critical ear, and the device compensates for that low score with elegant simplicity and a personality which I haven’t seen in any of my toys in a decent while. Hey there, If you are reading this, it means you’ve successfully followed my blog to its new home. If you must know, I migrated to wordpress because I find it far more awesome that Blogger. I took the liberty of renaming the blog also to “Gas Cooker”, which is supposed to make you chuckle when you hear it. My reason for choosing that name is quite simply because it makes me chuckle to hear a blog go by that name. I will also try harder to bring you more home-cooked, hopefully funny, and witty articles every now and then. Yes, I know this short note is not exactly a fine example of smooth talking. Bear with me, its just an announcement.